Hannover, Germany – June 29, 2011 - videantis GmbH has successfully realized a multi-core, multi-standard high-definition (HD) video processing solution in the most advanced high-performance 40nm low-power CMOS technology together with Infineon Technologies (now Intel Mobile Communications). The working silicon is available since end of 2010. 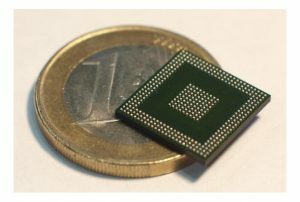 The multi-core chip was developed by videantis and is especially designed for high-definition video, multimedia, and safety applications in energy-aware environments such as mobile or automotive application domains. The IC integrates the third generation of a complete video subsystem including the firmware-upgradeable v-MP4280HDX multi-standard high-definition video IP solution, occupying only 4.28 mm2 of the die area. By combining a set of innovative low-power design approaches such as selective reading for reduced memory activity, fine-grain clock gating to dynamically disable inactive processing units, and special low-power instruction set extensions, a break-through in low power consumption is achieved with only 5mW for a single video core at an operating frequency of 400MHz. Additional power management features implemented include voltage islands with power gating, and multiple internal clocks. Leveraging videantis’ unique programmable stream and video engine architectures, the chip supports all relevant video compression standards including H.264/AVC, MVC, MPEG-4, DivX, Xvid, WMV9/VC-1, MPEG-2, H.263, RealVideo, Sorenson, On2 VP6, and Google VP8/WebM Project in full HD quality, and is upgradeable per firmware update to future upcoming standards on the same device. Besides video compression and decompression, it is further ideally suited for advanced application-specific video processing solutions such as high-quality multi-format video transcoding, high-end frame rate conversion for mobile and consumer applications, robust video stabilization for mobile environments, and optimized OpenCV-based face and gesture recognition as well as image and video processing libraries for advanced automotive driver assistance applications such as adaptive cruise control, lane detection, vehicle detection or night vision. The videantis video processor was developed and tested based on the 40nm platform technology of Infineon Technologies (now Intel Mobile Communications). It combines excellent chip performance for most advanced applications at very low power consumption with a design system fostering first-time-right realizations. videantis GmbH of Hannover, Germany, is a leading silicon IP, and software solutions provider for mobile, home, and custom multimedia applications. videantis combines the expertise of an application-adapted, yet fully programmable architecture, an extensive portfolio of optimized applications, and system-on-chip integration services to offer comprehensive one-stop video solutions. Based on its application-optimized processor platform family, videantis licenses multi-standard capable video IP solutions for the most advanced video coding standards, including VP8, VP6, H.264/AVC, MPEG-4, H.263, DivX, WMV9/VC-1, MPEG-1/-2, and RealVideo and video enhancement. For more information about videantis, please visit http://www.videantis.com. Trademarks mentioned in this release are the property of their respective owners.